Just finished a book blog tour organised by the lovely Kelly Lacey of #lovebooksgroup. Here is the review from Joanne of #the portobello book blog. Mention The Gorbals to most Scots and they will immediately think of the infamous area of Glasgow known for gang violence, poor housing and high unemployment before much of the housing was cleared and the area regenerated in the late 20th century. 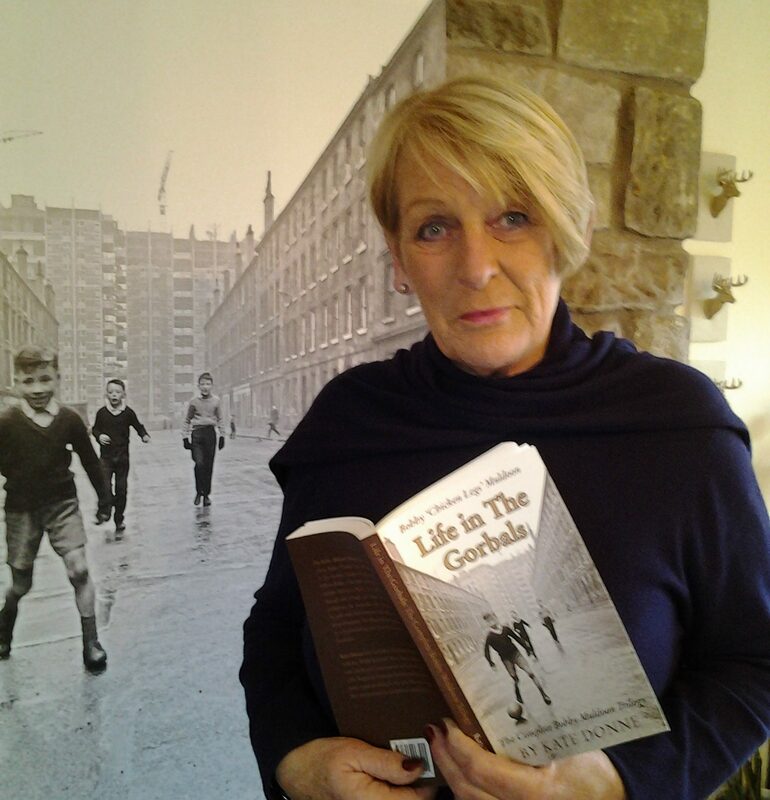 Fame and Fortune in the Gorbals follows young Bobby Muldoon (also known as ‘Chicken Legs’) in the third book of Kate Donne’s trilogy, in 1960s Glasgow. This short book is written largely in dialect, which could prove something of a challenge for non-Scots. Having been brought up on a diet of Oor Wullie, The Broons and Rab C Nesbitt, I enjoyed the dialect and it meant I could really hear the characters in my head. The book shows a side to the Gorbals which is often forgotten: that the area was populated with lots of decent hard-working folk all doing their best to get by. Bobby is such an endearing character. Although only 16, he seems very mature. He can sense the difficulties in his parents’ marriage and is very much an ally to his dad against his mother’s nagging and rage. He is in love with young Jeannie, who is just about to start training as a nurse and he is hoping to become a bricklayer’s apprentice. The young couple have plans, hopes and dreams – high ambitions it seems for a couple so young. There are quite a few chapters which will resonate with readers and bring back memories such as family parties where you made your own entertainment and simple holidays at Scottish coastal resorts such as Rothesay enjoying fish and chips, ice-cream and the shows. It maybe seems a bit daft to read the last in a trilogy without having read the other two but as is often the case, this wasn’t an issue. The book is very much focused on young Bobby and his aspirations and although he mentions a couple of things which must have happened in the previous books, I didn’t feel at any point that I couldn’t follow the story. Overall, this was a very enjoyable read. As I said, perhaps a bit challenging to non-Scots but I think that the anyone who can understand the narrative will love the character of Bobby and be cheering him on, particularly towards the end when it seems that fame and fortune may come his way. I have to say it couldn’t happen to a nicer young man. A lovely review on Goodreads! I received a copy of this from the author via a Goodreads giveaway which I entered as the blurb sounded interesting. The book is written entirely in Glaswegian and as a Sassenach I at first found it hard to read fluently as I needed to translate it as I went along BUT, by the end of the first chapter it clicked and the rest of the book flew by as I got wrapped up in the life of Bobby and his family trials and tribulations. It reminds me of the Adrian Mole diaries which I read years ago and brought back memories of my own teenage years. All-in-all this was an enjoyable read and I think it is worth Kate Donne writing a full, novel length story about the characters as once you get the hang of the Scots vernacular it is surprisingly fun to read.